This weekend we indulged in our first haskap/honeyberry wine comparison taste test. Our friends, Al & Ruth Rasmussen, neighbors here at Bagley, MN, were happy to oblige. After a simple supper from produce all off our farm – crock pot lamb roast, potatoes, green beans, and roast beets, we served a sweet desert wine made from elderberries. We like our elderberry wine, but what we were really waiting for was to find out which of our four varieties of haskap/honeyberries would produce the best tasting wine. #4 Czech #17 (Berry Smart Blue): 3 people did not like it at all. “Nope, not smooth. Bad aftertaste that grabs you right away. Violated my taste buds.” BUT one person liked it as much as Tundra. Go figure. This is the only pure Russian variety. The others all contain some Kuril Island genetics, closer to the Japanese varieties, which gets away from the strong and sometimes bitter characteristic of many Russian selections. The Russian varieties seem to be fine baking, jams & jellies, and we eat them fresh as well, but beware of the wine! Mixture of all 4: Not as bad as Czech #17, some good flavors came through. Conclusion: All of the University of Saskatchewan selections of haskap produced a very fine wine, appealing to the majority. As new varieties of haskap / honeyberries are coming out every year, most of them with some Japanese genetics, we presume they will turn out some great wines as well. After a few days, remove the berries and drain, add the drained juice back to the container, and add 1/2 tsp Lalvin 71B yeast per gallon. Transfer into a jug which can be plugged with a topper to continue the fermentation process for 6-8 weeks prior to bottling. We plan to “rack” the wine for a few weeks prior to bottling, which means transferring the wine from one jug to another, leaving the thick, cloudy “dregs” at the bottom. The temperature for this batch hovered around 75F but was by no means constant. 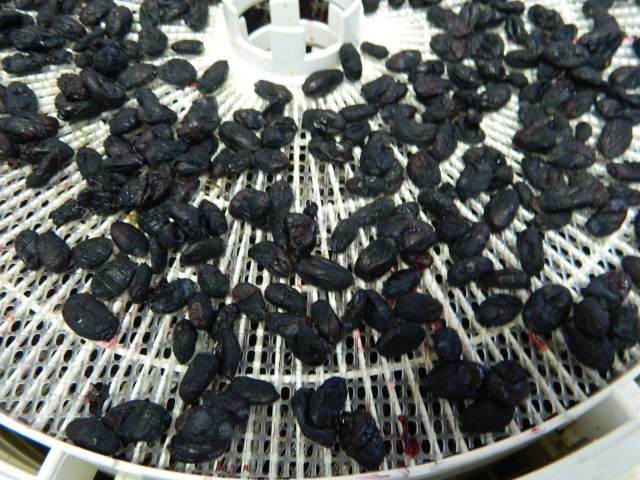 Our first haskap wine making experience gave us enough confidence to continue on with larger batches in the future. We like to keep things simple, and discovered that simple worked just fine for us (see more at staircase winery procedures and observations). For more detailed/complicated info on making haskap wine see the University of Saskatchewan’s winemaking notes and Edible Blue Honeysuckle blog’s notes. 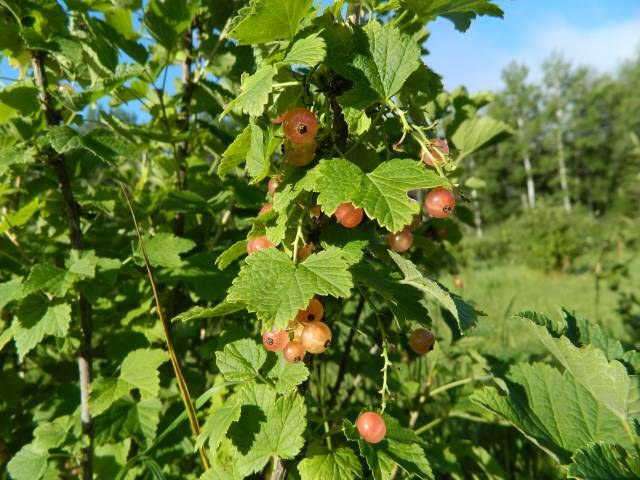 Summer has flown by with the ripening of dwarf sour cherries, currants, and gooseberries in our fledgling orchard. We escaped a September frost, giving the Sambucus canadensis elderberries a chance to ripen. 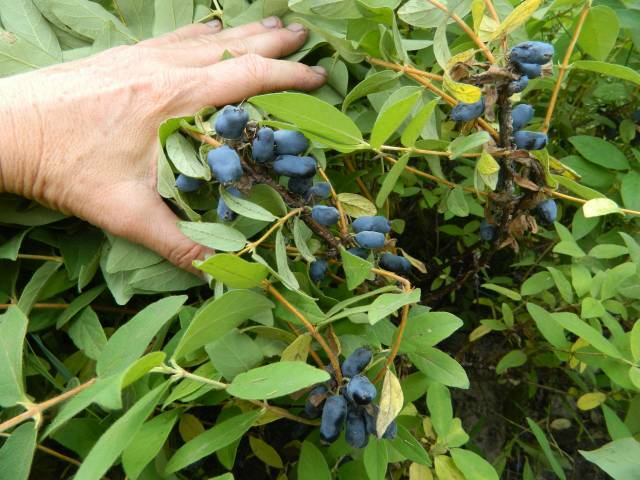 A few late planted Auroa haskap (honeyberries) surprised us with a few berries this fall as well. We have a volunteer from wwoof.org who agreed to share his first impression of a fresh honeyberry. 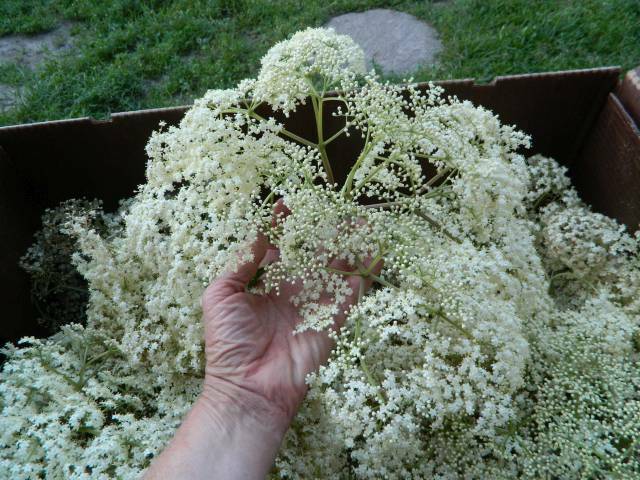 While we’re finding it chancy to get elderberries to ripen, we are discovering many great uses for elder blossoms. 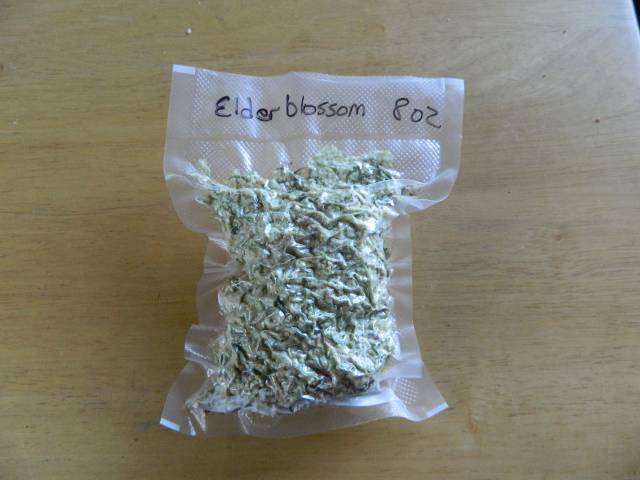 We’re trying our hand at non-alcoholic elder blossom cordial, tea, dried berries, and wine. More recipes and great info on the uses of elder to combat the flu virus can be found at The Wellness Mama‘s site. The blossom season runs from July through September. First year shoots blossom later than older stalks. The blossoms smell terrific and are a pleasure to handle. 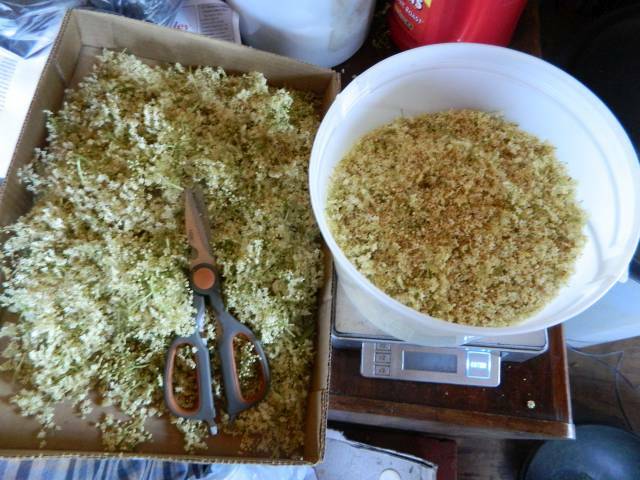 We dried as well as froze many, many cymes (blossom heads). 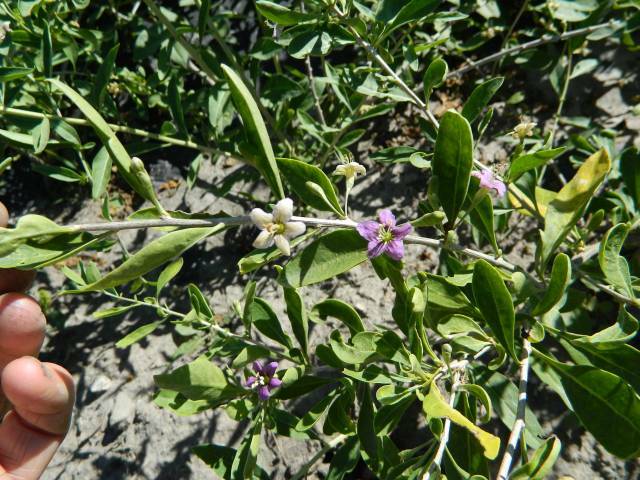 We were also delighted to find our first goji blossoms and little green berries beginning in late August and still blossoming. Mid to late July brought us delicious cherries. 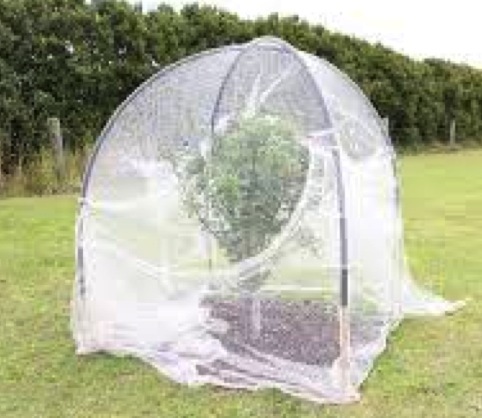 For the home gardener, netting from Plantra, draped over a frame surrounding the fruit bush, is a good option. Red, white, pink and black currants ripened throughout July as well. Enough for now – you’ll just have to come see for yourself someday how blessed we are! We opened up for Pick-Your-Own honeyberries this week and it is always a pleasure to meet the people who come out to enjoy some time in the orchard. Will and Jackie Atkinson and their summer apprentice drove all the way over from the Iron Range to pick some berries and visit with us. Will and Jackie live in northeastern Minnesota where it gets even colder than where we are. Lifetime homesteaders, they stumbled into the seed saving business, and you can read more about them and their business at www.seedtreasures.com. 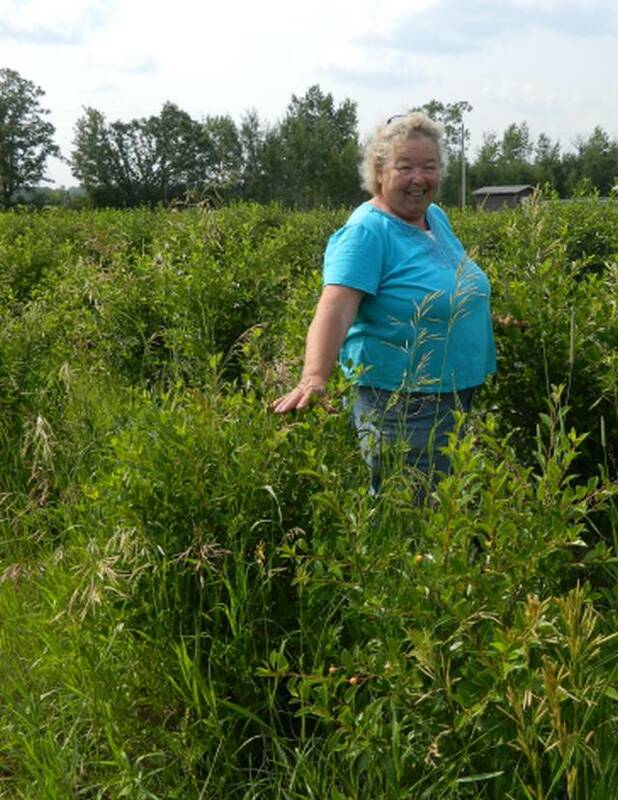 Jackie is also well known for her Backwoods Home column “Ask Jackie” (about anything and everything to do with homesteading!) as well as her blog, cookbooks, novels, and animal care books. You can imagine we had a lot to talk about and the afternoon passed by very pleasantly. Jim had to duck out early to help a neighbor bale hay while we continued on with the zone 3 cold hardy orchard tour. Jackie often jokes about showing folks how not to do things, and the picture below is definitely one of those cases! Do NOT let the grass crowd out your cherries – the difference is dramatic. The best scenario we have found is to plant into plastic for weed control as well as till in between the rows. Jackie compares Carmine Jewel cherries in quack grass and weeds to younger but taller ones planted in plastic. One other thing we noticed was the frost line – cherry blossoms at the top of the hill survived 26 F frost and are producing a nice little first crop (planted in 2013) while those further down the hill did not. 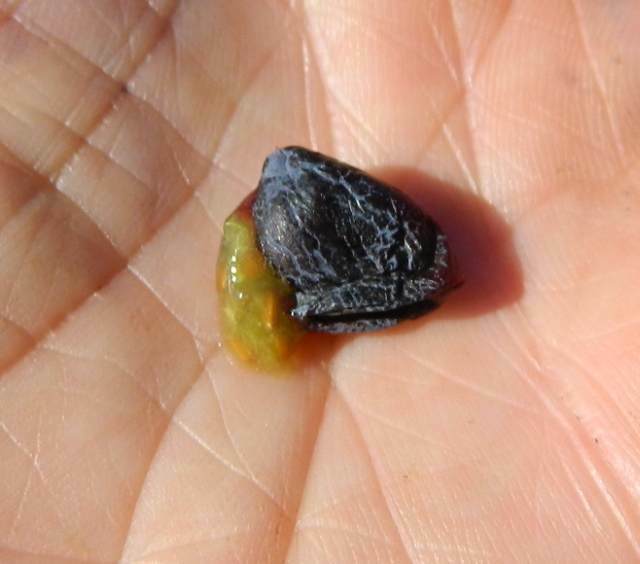 Do not plant cherries in frost pockets or where they will get wet feet – even though our low spot does not have standing water, they still do not grow well there. 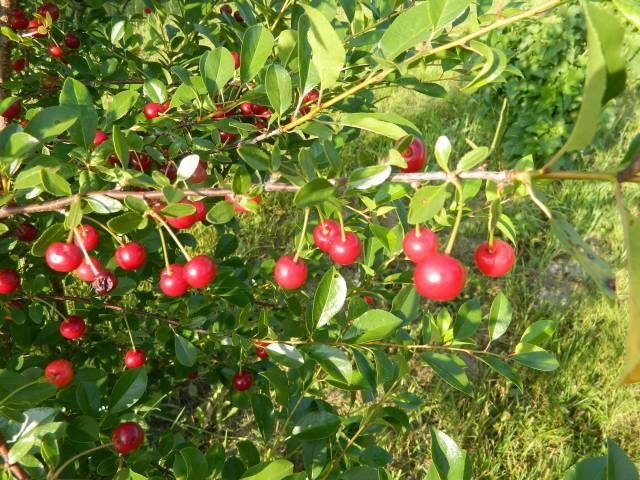 The other excitement happened when FedEx delivered Romeo and Juliet – the long awaited dwarf sour cherries newly available in the USA from the University of Saskatchewan breeding program. While later than normal in the season to plant, it’s only in the 70’s and 80’s these days, and we have our rows laid out in plastic and drip tape. 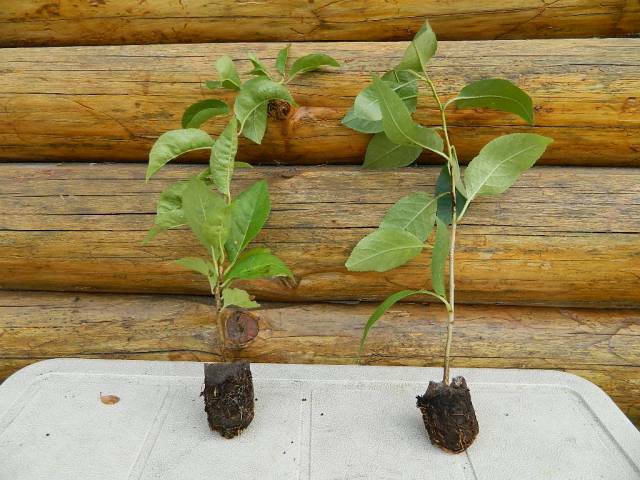 We plan to grow out most of the plants for shipping bareroot our customers. I’ll also mention that earlier in the week we had a visit from Joe and Steve, owners and founders of Plantra. They stopped by with some samples of their netting, which is much easier to handle than what I tried from local big box hardware stores. 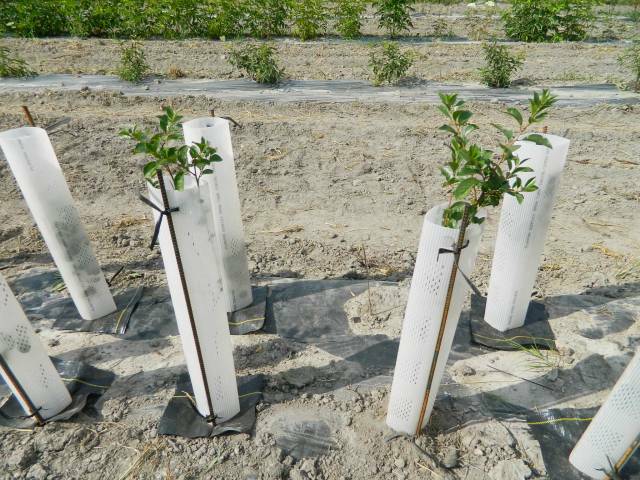 We also like their grow tubes which protect our nursery plants from rabbits and rodents, and also provide a little extra boost of heat. The also have wider tubes for garden vegetables like tomatoes and melons. Check ’em out! 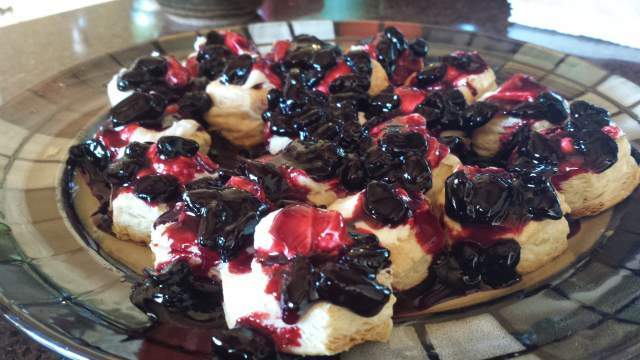 What a delightful surprise to be invited to a neighbor’s for lunch yesterday and be served bite-sized honeyberry cream puffs! 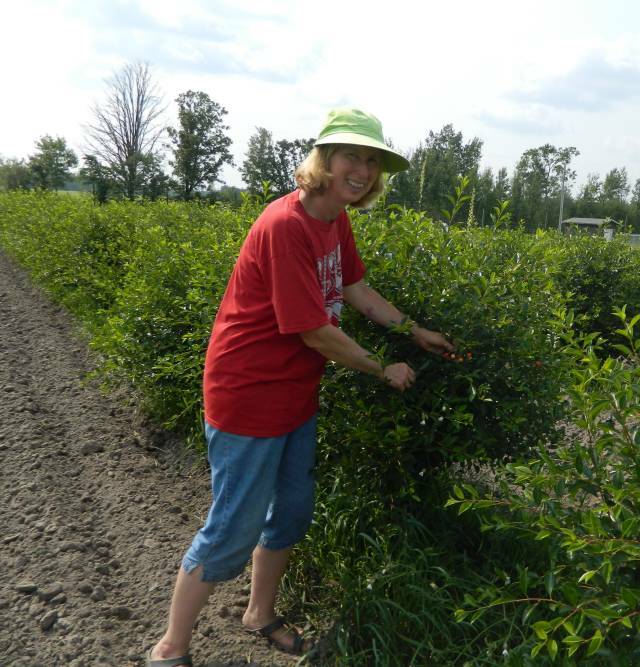 Nancy was one of our U-Pick customers last year, and said she added just a bit of lemon to the honeyberry sauce made from frozen berries. They tasted just as good as they look in the picture below. Our friends over at Dakota Sun Gardens Winery at Carrington, North Dakota, won their second award recently for their haskap wine. The Jefferson Cup Invitational Wine Tournament, held November 20 and 21, 2014 in Kansas City, Missouri, awarded them a “Medal of American Merit” in the dessert category. They also won a Double Gold award this spring in the Taster’s Guild competition in Michigan. This is the first year we had enough aronia to do a decent evaluation. Last year we had a few berries to sample from our first bushes and we were not impressed. I’m sorry, but we have been spoiled by the fantastic fresh flavor of the haskap/honeyberry. The aronia taste somewhat like chokecherries to me, but a drier berry, and leave the mouth feeling dry. But I’ve heard that many people put aronia into smoothies, so this morning I threw a small cluster into the blender with some milk and voilà – I liked it! Not overbearing with any particular flavor, but pleasantly “berry-ish”. I thought it could use just a bit of sweetening so added a very light dash of stevia powder and that perked up the flavor even more. 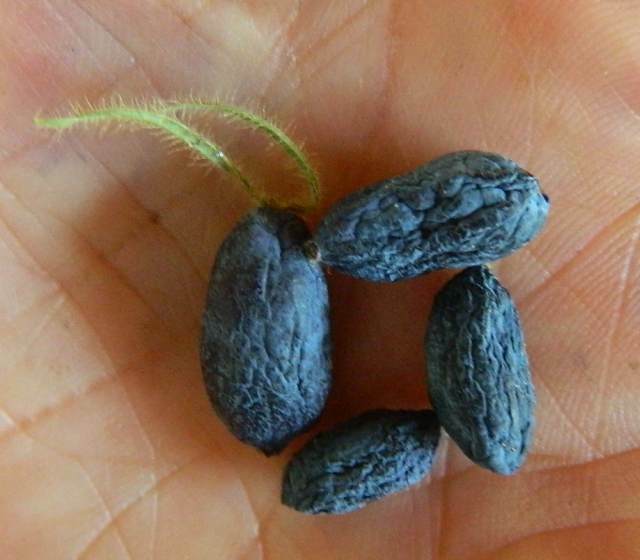 I noticed some chewy pieces of skin and a few grapeseed sized seeds which I ate, and it reminded me that the honeyberry skin and seeds are usually unnoticeable. Never-the-less, I am glad to report that after today’s sampling, the aronia gets to stay in the orchard. Starting with honeyberries in June, followed by strawberries, raspberries, saskatoons and cherries in July and August, overlapping with currants and then plums and apples into September, and finally winding up the fall with grapes, elderberries and aronia, we are very thankful for close to four months of non-stop fresh fruit here in zone 3. OK, I confess the cherries, apples and plums were light this year, but that’s one reason very good reason to diversify. Our goji, kiwi and seaberry bushes need to get a bit older to start producing, but there are wild American highbush cranberries along our driveway if anyone wants to come pick! And I almost forgot the ground cherries and garden huckleberries from neighbors’ gardens. These are annual fruits you can grow in a single season, while you wait for the perennial bushes to mature. I eat the former, Physalis pruinosa, like candy, while the latter, the Solanum melanocerasum, need a little work to make them palatable, like the aronia. Fall shipping starts in a couple of weeks when the plants are dormant and prior to freeze-up, then maybe I’ll have some time to try some more recipes, and different combinations. 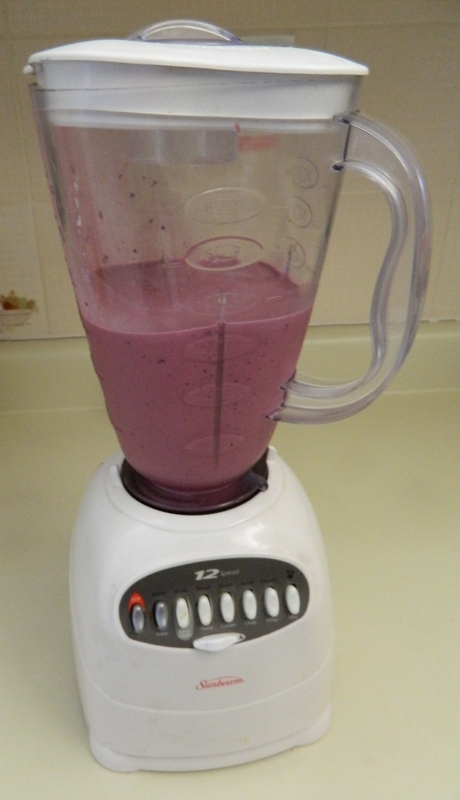 Frankly, just eating the honeyberries right out of the freezer is good enough for us most of the time, a delicious and healthy dessert, but now I look forward to a winter of trying different kinds of smoothies as well. 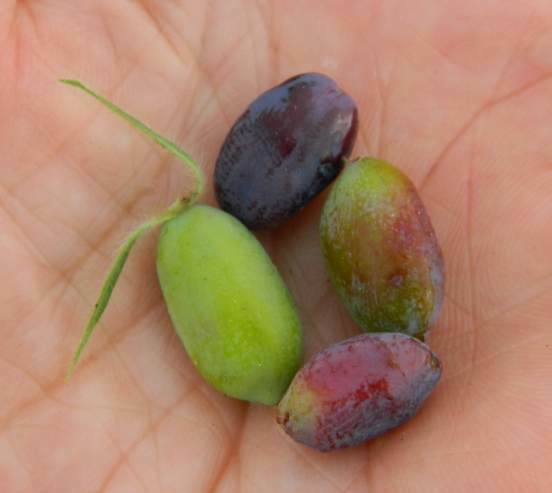 We are busy picking honeyberries from our 3 year old orchard of 850 bushes planted in 2011, but here are a few things we have learned about the fruit. June 21, 2014 Tundra berries picked and set inside cupboard to see if they would ripen off bush. Nineteen days later, on July 7, 2014 the berries had all turned blue on outside, but what about the inside? Looks pretty green, and at 8 brix, it’s pretty sour. Other berries which ripened on the bush were running between 11 and 14 brix. We are freezing most of what we pick as it is the fastest thing right now, but here are some other ideas for preserving the berries. 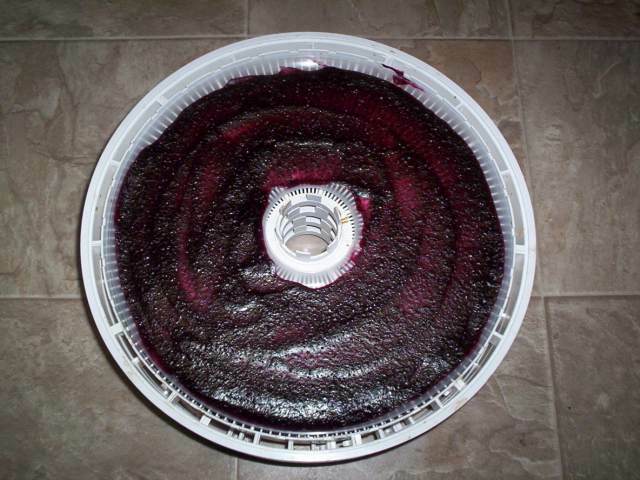 Fresh berries do not dehydrate well in the electric dryer. The berries are of uneven size so dry unevenly, with the smaller ones turning crisp and the larger berries staying juicy, even after a day in the dryer. Better just to leave them out for a month and let them dehydrate naturally. Put berries into blender, add honey for pliability and sugar to taste (honey alone may overpower the berry flavor), grease the tray with a mild flavored oil such as coconut oil, and dehydrate a few hours. You can start out at 160 F and then turn down to 115 F says my dehydrating manual for blueberries. Or just stick it into your vehicle with the windows rolled up on a sunny day! Dry until able to lift pieces off the tray. This will keep for months, if not years! 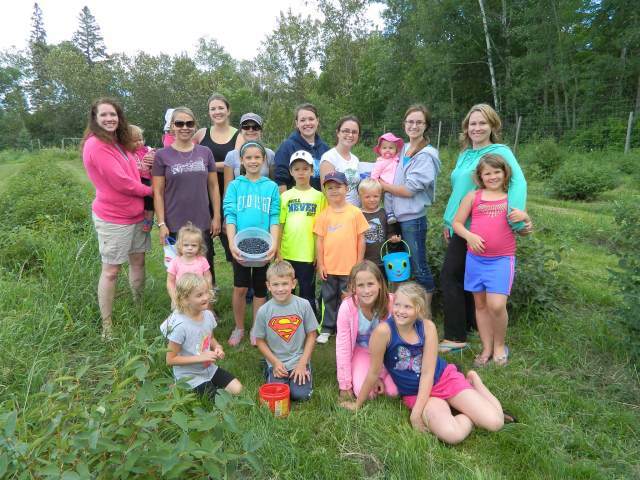 Berry picking is contagious – just ask these nurses and their kids from Sandford Hospital in Bemidji, MN! Finally, a big thank you to the adventurous U-Pickers of all ages (babes in arms to 90+ year olds) who ventured to our farm to pick, and then told and gave samples to their friends and family!